This dress made me feel effortlessly beautiful and confident on my wedding day! What I loved about the dress was the elegant neck and back balanced with the delicate little applique flowers which made the dress feel classic without being overly simple. Also the champagne color adds a richness to the dress that compliments warm skin tones beautifully. The dress fit me very well and I was glad the only alternation I had to do was raise the hem. I am 5'2.25" 107lbs and paired the dress with 4" platform heels. I didn't have to wear any special bra or under garments as cups were built into the bodice, normally I wear a 32B. Another thing I loved about the dress is it's not tight or restrictive at all--I felt free to eat, move, breath and pretty much be free to enjoy my day. I only wore the dress during my sit-down reception so it didn't have to survive any dancing or excessive sweat or outside elements. Additionally I had the dress professionally cleaned and preserved by "Memories Gown Preservation" which includes a 30 year warranty. 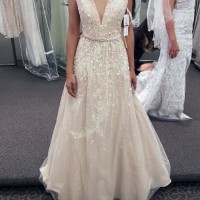 I brought the dress to a professional tailor to raise the hem--I am 5'6.25" in my wedding heels and the dress was hemmed to be a floor length dress without dragging of the ground. No other alterations occurred. Once you send a message, Malika can invite you to purchase the dress.